The Transition Home Survey is a census survey of residential facilities conducted every two years. Questionnaires are mailed to every known shelter identified as providing residential services (shelter) to abused women in every province and territory. Information is collected on the characteristics of the facilities and the services provided during the previous 12 months. The survey also includes a one-day snapshot providing information on the characteristics of women and children residing in shelters on a specific day. *Other types of shelters include all other residential facilities offering services to abused women with or without children, not otherwise classified. This category includes Rural Family Violence Prevention Centres in Alberta, Interim Housing in Manitoba, and other types of emergency shelters such as the Young Women’s Christian Association (YWCA). Note that these services may not be exclusive to abused women. 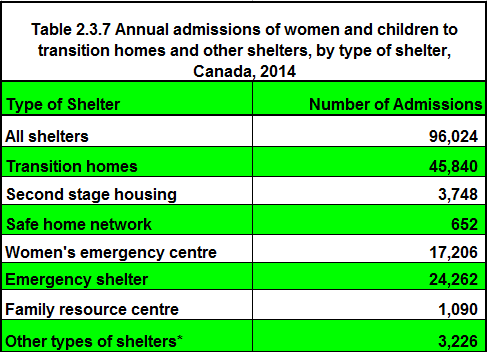 Source: CICH Graphic created using data adapted from Statistics Canada, Table 256-0013 – Transition home survey, annual admissions of women and children to transition homes and other shelters, by type of shelter, Canada, provinces and territories, every 2 years (number). http://www5.statcan.gc.ca/cansim/a26?lang=eng&retrLang=eng&id=2560013&&pattern=&stByVal=1&p1=1&p2=-1&tabMode=dataTable&csid= -accessed July 18, 2017. In 2014, over 96,000 women and children entered transition homes or other shelters in Canada. About 24,000 of these were emergency shelters. Almost 46,000 were transition homes.